The Oconee County Chamber of Commerce has scheduled its candidate forum for Tuesday, April 22, at the Civic Center, 2661 Hog Mountain Road. That forum also begins at 6 p.m. and ends at 8 p.m. The third forum will be held on Wednesday, April 23, at the Oconee County Library, 1080 Experiment Station Road in Watkinsville. That forum, organized by citizens, will be from 7 to 9 p.m.
Two candidates have filed to seek Post 2 in the May 20 Republican primary, incumbent John Daniell and John Larkin. Three candidates have filed for Post 3 in the Republican primary. 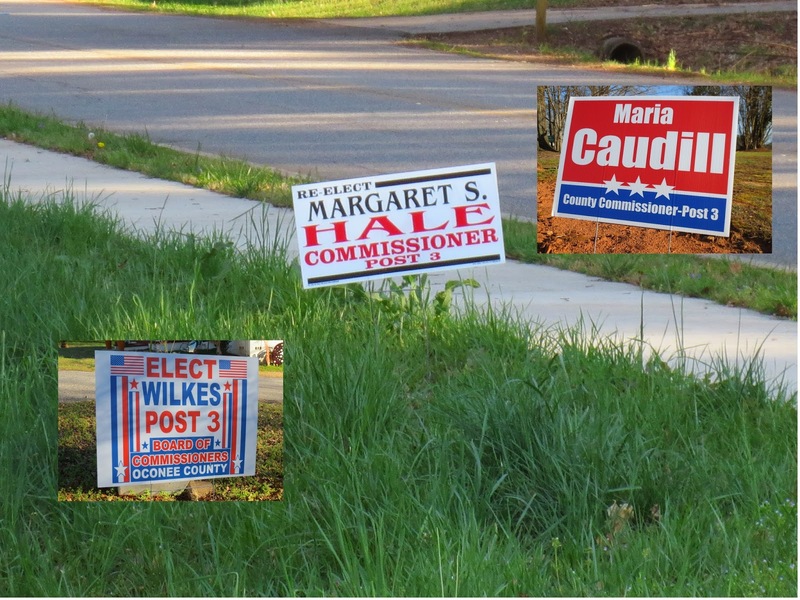 They are incumbent Margaret Hale, Maria Caudill and William E. “Bubber” Wilkes. Kim Argo and Mark Thomas, both incumbents, have filed for the Republican nomination for the two posts they now hold on the Board of Education. No one filed to run against them. No Democrats filed for the BOC or BOE races, the only county contests on the ballot in May. Regina Quick and Chuck Williams, who represent Oconee County in the Georgia House of Representatives, both also will be listed unopposed on the Republican primary ballot, as will Bill Cowsert, who represents the county in the Georgia Senate. No Democrat has filed for any of those three offices. Voters do not register by party in Georgia, and any registered voter can request the Republican or the Democratic ballot on election day. Eligible voters can register until April 21, either at the Oconee County Board of Elections and Registration office at 10 Court Street, next to the courthouse in Watkinville, or online. Early voting will be possible at the Board of Elections and Registration office starting on April 28 and continuing until May 16. The office is open from 8 a.m. to 5 p.m. Monday through Friday. Early voting also will be possible at the Board of Elections and Registration office from 9 a.m. to 4 p.m. on Saturday, May 10. Early voting also will be possible from 8 a.m to 5 p.m. from May 12 to 16 at the Civic Center on Hog Mountain Road. The Republican Party forum on April 17 will begin with a “meet and greet” session from 6 to 6:30 p.m.
John Daniell and John Larkin will take questions from 6:45 to 7:15 p.m. Caudill, Hale and Wilkes will take questions from 7:15 to 8 p.m.
Chamber of Commerce President Kay Keller told me on Friday that the April 22 forum will include both the BOC and BOE candidates in a session from 6 to 6:45 p.m.
She said that the Chamber is inviting the eight candidates seeking the open 10th District seat in the U.S. House of Representatives to the second session of the forum, which will start about 6:45 p.m.
Those candidates are Democrat I. K. "Ken" Dious and Republicans Brian Richard Slowinski, Donna H. Sheldon, Gary Gerrard, Jody B. Hice, M. A. "Mike" Collins, S. Mitchell Swan and Stephen K. Simpson. Russ Page and I have organized the forum on April 23 at the library. Only the five BOC candidates have been invited. All have indicated they will attend. According to the Declaration of Candidacy documents, John Daniell, 46, lives at 1922 Elder Road near North High Shoals. He lists himself as president and CEO of Daniell Transport. John Larkin, 37, lives at 160 Westwood Avenue in Bogart. He lists his occupation at IT. Maria Caudill, 62, lives at 1300 South Rossiter Terrace outside Watkinsville. She lists herself as a retired administrative executive. Margaret Hale, 52, lives at 1901 Salem Road in Farmington. She lists herself as an administrative specialist II. Bubber Wilkes, 65, lives at 1061 Flat Rock Road south of Watkinsville. He lists himself as retired.